Check out what’s new at Pro Prints Gear. We are continually improving our systems, equipment and partnerships to ensure the best service possible. 887 pieces ordered 11/22/2016 12:30 pm. 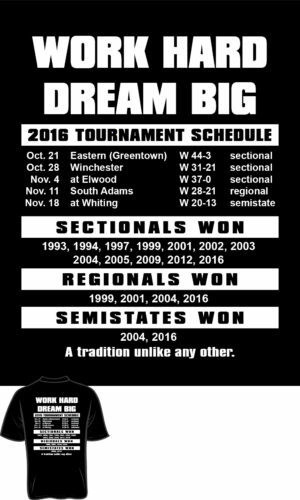 to Eastbrook HS… Job well done!! Our own Adlai Deisler just attended a week long workshop at SGIA (Specialty Graphics and Imaging Technology) headquarters in Fairfax, VA. The workshop was 100% garment printing from beginning to end, hosted by top specialists in the industry. He returned with some fresh ideas and upgrade projects. Continuous improvement and continuous education is something we strive for! Liberty Bottles available for sale price of $19.99, MSRP $23.00. 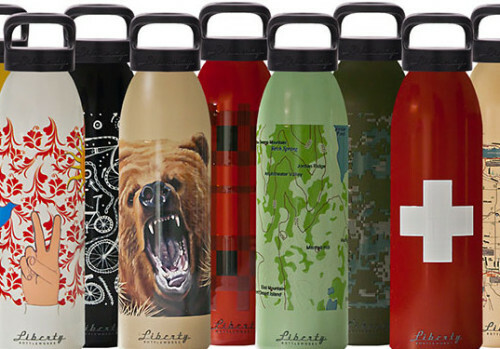 These beautiful bottles are made in America from recycled aluminum with outstanding quality and cool art! We can also order custom for your business, school or church. Stop in to see the designs we have available. 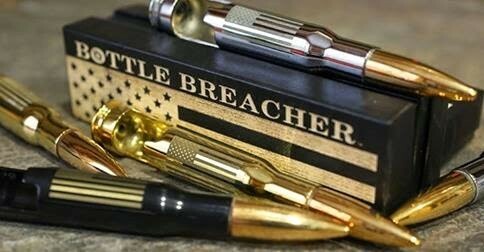 BottleBreacher bottle openers as seen on Shark Tank! All handmade in America by veterans, these make unique gifts and support a worthy cause. Kyle and Cliff spent two days in Missouri training with one of the masters, Justin Pate! Kyle also had previous training with GeekWraps through 3M. We are constantly working towards continual improvement in all areas. Call us for a quote! 10-2015 NEW SCREEN-PRINTING PRESS to be in service in November! UPDATE: Our press is up and running smoothly. We are ready to produce your large multi-color orders! Give us a call! Our new press will allow us to provide more options in your artwork, we can now print up to 12 colors on one design, faster, larger, and with better quality! M&R’s Sportsman EXG automatic screen printing press is exceptionally fast, with a larger (20” x 20″) maximum image area, and compact footprint. It offers a wide array of standard features, starting with a servo-driven indexer that combines higher screen printing speeds with exceptional smoothness, consistency, and longevity; variable-speed electric printheads for smooth print strokes and exceptional control; central off-contact for fast, incremental single-lever adjustment of all stations simultaneously; and a color touchscreen control panel with graphical display that provides onboard self-diagnostics, real-time production data, and user-friendly control over most press functions. Check out our new design studio, with thousands of preloaded clip art images, or upload your own! Build your own design and order online today! Click here to get started. 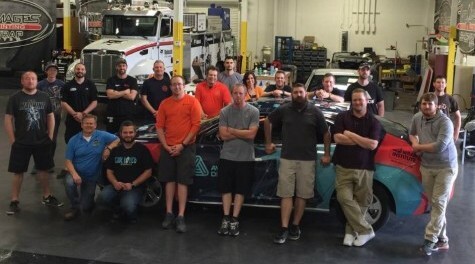 In our continued efforts to provide the best services, two Pro Prints Gear employees have recently completed 3M Advanced Installer Training for vinyl vehicle wraps at a 3M Certified training facility in Fort Lauderdale, FL. Contact Pro Prints Gear today to see how your business can benefit from a vehicle wrap. 2015 We have been working very hard behind the scenes! Pro Prints Gear has implemented new company wide software. This will enable us to provide a more efficient workflow, better quality product, and more timely turnaround for our customers. We are working hard to improve our product and customer service to better serve you! 2014 SILICONE INK in the screen printing department! This is an exciting new technology in the world of ink and has just recently become available. Pro Prints Gear pushed to be one of the first printers to use this product. 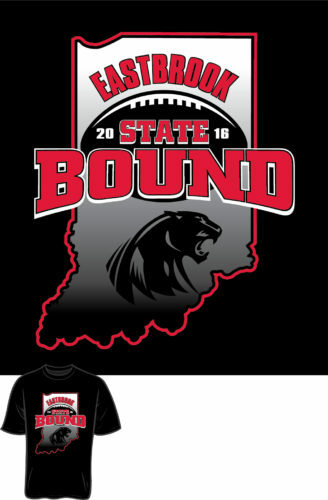 It enables us to print on stretchy athletic apparel without the ink cracking, as well as preventing color bleed-through on sublimated polyesters. 2014 NEW Eco-Solvent 64″ digital printer! We received our new printer late last year and we have created a new clean-room environment for our digital printing/cutting and graphics department. With our top-of-the-line printer and laminator, we can provide you with excellent quality products in our vinyl graphics, vehicle wrap, and sign-making departments. We now have a designated area in our new graphics studio to install your vehicle graphics and wraps! We’ve also updated our rotary engraving equipment and software as well as up-to-date training for our operators.